Every spring, migratory birds like the Black-throated Blue Warbler journey from tropical Caribbean or South American refuges to North American forests. But which forest patch will they call home this year? And, how can researchers predict where they choose to nest? Ecologists studying biodiversity and conservationists preserving habitats have asked these questions for more than 50 years, but with limited and imprecise means to answer them. Now a team of NASA-funded researchers has completed an experiment to remotely sense and predict where certain birds are most likely to live and breed. In the late 1950s, Princeton University ecologist Robert MacArthur proposed that bird species choose their habitat according to the structure of a forest - that is, the tree canopy height, branching structure, leaf spread and abundance, and the presence of low-lying shrubs. To determine the habitat where particular species bred, ornithologists trekked deep into forests and used everything from binoculars to suspended vines to observe leaves and twigs and extrapolate the make-up of forest areas. They could spend thousands of painstaking hours analyzing plots as small as 100 square feet. As recently as May 2010, an Oregon State University doctoral student dislocated her shoulder while using a rudimentary pole to demonstrate how scientists once measured tree branches from the ground -- and to show how and why the science of studying birds has changed. "Most of the time, the data weren't very good, and didn't cover broad areas of land," said landscape ecologist Matt Betts, an assistant professor at Oregon State University in Corvallis. A research team led by Scott Goetz of the Woods Hole Research Center in Falmouth, Mass., has helped bring habitat sensing into the 21st century. The researchers combined satellite data, a ground-based bird census, light detection and ranging (lidar), and a new modeling technique to correctly predict the presence of songbirds in a forest. Their results were published this week in the journal Ecology. "The study of bird habitats has entered a new era," said Goetz. "Until recently, predicting bird habitat was limited. We've known for many years that the composition of trees and shrubs determines habitat quality, which in turn influences a species' presence and population density. But this study uses remote sensing to accurately predict which habitats birds prefer to use year after year, over many square miles of complex terrain." According to Goetz, NASA's Laser Vegetation Imaging Sensor (LVIS, pronounced Elvis), was key to the team's success. The instrument sends pulses of laser light down from an airplane toward the forest canopy and records the points at which signals bounce back from leaves, branches, and land surfaces. Goetz and colleagues analyzed the data to confirm things like canopy height - the difference between the top of a tree and the ground - and the top-to-bottom density of tree canopies. "We're doing the same thing our predecessors did, but in much more detail and over a much broader area," said Betts. "We have new metrics now that just weren't possible before." When combined with data from the NASA-built Landsat satellite - which can indicate seasonal changes in the amount of vegetation -- the LVIS data indicated not only the height of the trees but whether they have mostly high branches or lots of canopy layers beneath tree tops. 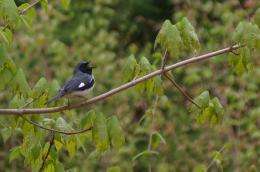 For the study published this month, the team made field observations of the Black-throated Blue Warbler, a small songbird that prefers lower-lying vegetation. 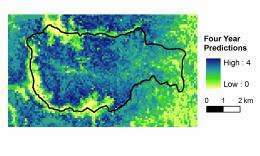 Using four years of LVIS data, the researchers ranked various forest habitats as good, fair, or poor based on canopy structure. Their "good" rankings for the warbler matched actual ground data -- showing the actual presence of the species in each habitat -- 90 percent of the time. "For predicting species across broad landscapes over time, this lidar technology is incredibly valuable," said Betts, a co-author of Goetz's study. "We can now conduct higher-quality estimates of the relative importance of climate versus habitat structure in affecting animal populations.". And this technique should transfer to predictions of other animals whose habitats are associated with canopy structure, like flying squirrels or martens. If we can track downed logs on the forest floor, we could even model habitats for salamanders." Surveying bird biodiversity from space?